Our paper solutions for packaging of bakery products are fully compliant with food hygiene standards, being in direct contact with food. Our paper cushion pads for bakeries maintain freshness and ensure protection of each food during cooking until it comes on the consumer's table. 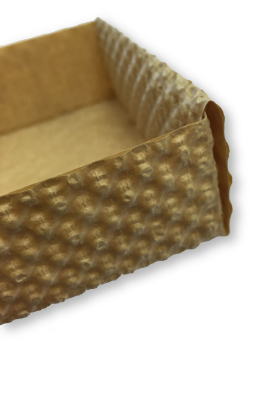 In addition to cushion pads, we also produce embossed paper boxes suitable for transporting baked goods cooked, soft and friable. Thanks to the shape and strength, our boxes provide high protection to the food contained therein, as well as allow stacking and packaging for delivery to the stores. We offer different paper solutions for bakery applications, such as baking pads resistant to oils and fats, corrugated greaseproof pads, baking cases,ovenable pads, paper containers and layer pads for bakery dough, packaging for baking bread, cakes and biscuits.